It meets the M61 at junction 3. It's short, a whole 1.5 miles (2.5km) long. And secretive about its number, too. Isn't it just part of M61? You would think so, both from looking at modern maps, and from the signposting, which reads "M61" in one direction and "(A666)" in the other. So how do you know it isn't? Firstly, many maps from the 1970s showed it as A666(M), as can be seen here, and thanks to Jonathan Cossham, here. Secondly, there is a section on Lancashire County Council's website called "Historic Highways", that has a section here devoted to the A666 and A666(M). And they should know, after all they built it! So, where does it exactly start? Well, there's two schools of thought on this one. Some people think that it starts at M61 J3, where traffic from M60 chooses whether to head into Bolton, or continue towards Preston on the M61. Others seem to think that the M61 never actually meets the M60, and that it's all A666(M) from the M60 - and the M61 really ends on the A580. Which is true? Who knows? I've seen map evidence to suggest either is accurate, but I personally prefer the second, simply because of the way the roads are laid out in the area. Yes, Andrew Booth disagrees with me! The M61 actually continues all the way to the A666, the A666 is never the A666(M) or a motorway, The M61 It is split, yes, but just because the A666 is not in brackets when you are heading northbound doesn’t mean you are actually on the A666, just that you are on the M61 and you have to choose which way on the A666 you want to go to. I have to disagree with Andrew Booth. The motorway in question did open as A666(M) in 1970, a good few years after the Farnworth-Kearsley Bypass had been built (that section is not motorway though). The reason it is not signed as A666(M) is purely because of the fact it goes right onto the A666 without intermediate junctions. A lot of secretive A roads exist for the same reason too. Even I've seen this "non existent" motorway as the A666(M) in atlases as late as the early 1990s. I can say that as I'm only 22, so I'd have only been able to start understanding an atlas when I was about 8 or 9. (I think they appeared in motorist's handbooks too). Its not signed as A666(M) though, as when heading either onto the entry sliproad from the Kearsley roundabout or from the bypass under the roundabout, both sections of road are marked as M61. Just to add to my previous comments, also to back up the claim of the A666(M) running down to the M60, with the M61 terminating at J3 (or running down to the A580) is that when approaching the M60 from the north, the overhead gantry signs around J3 all show "(M60)" instead of "M61" (although for traffic heading towards the East Lancs Road, that lane is signed "(A580)"). Also to note, the Highways Agency has recently blanked out all of the little black labels on the gantry signs on the approaches to the M60 junction, effectively removing that interchange of its status as Junction 1. Could that have been moved to the terminus at the A580? 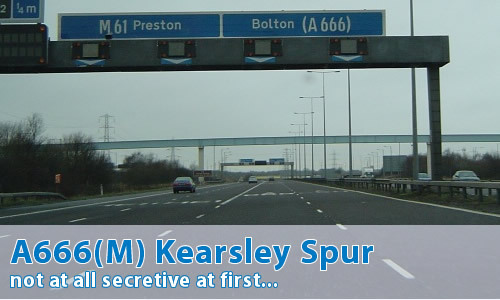 I exit the M61 at J3 southbound every day and travel on the short section to the Kearsley roundabout. I recently noticed that the overhead gantries and the retaining walls all the way up to the roundabout have M61 references, so the Highways Agency appears to think that this short spur is M61.